Theoretical and observational work led to the prediction of up to 100 normal pulsars and 1000 millisecond pulsars in the inner parsec of the Galaxy (Wharton et al. 2012). Despite continuous efforts to survey the Galactic Centre (GC), only five pulsars had been found within 15 arcminutes of Sgr A* until 2013. The non-detection of many pulsars in the inner parsec has been attributed to the interstellar medium and its “weather”, preventing the detection of pulsars at low freqencies (below a few GHz). Only recently has a radio magnetar, PSR J1745-2900, been detected at a distance of 0.1 parsecs (0.33 light years) from Sgr A* (Eatough et al. 2013 & Fig 1.). Fig 1. A radio-loud magnetar has been discovered as close as one third of a light year from Sgr A*, with an orbit of somewhere between about 500 years and 1500 years. Thats pretty close in astronomical terms, but for testing the space-time around the black hole, a pulsar in an orbit of less than one year would be ideal. 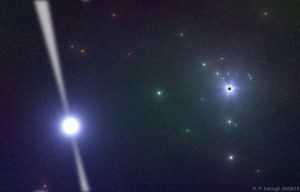 While evidence suggests that many pulsars should reside in the Galactic Centre, only 6 have been found within about 230 light years. The question is: Can we discover any more? Image information: Artists impression of PSR J1745-2900 in the direct vicinity of Sgr A*. © MPIfR/Ralph Eatough 2013. Our group, along with international collaborators , is involved in several ongoing multi-frequency surveys of the GC with the aim of detecting pulsars in even tighter orbits around Sgr A*. These include surveys at the Effelsberg radio telescope, observing at 5, 8 and 19 GHz; Parkes at 3 and 8 GHz and the millimetre observatories LMT and IRAM 30-m at Pico Veleta (87 GHz and higher). Once completed, the coherent addition of the 66 ALMA dishes has the potential to detect ~10% of the currently known pulsar population if they were placed at the GC (see Fig 2. below from Fish et al. 2013). Fig 2. This figure from Section 5. of Fish et al. 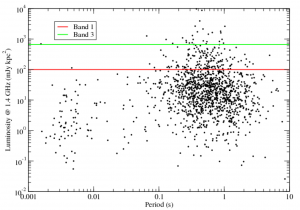 2013 shows the luminosity of the known radio pulsar population at 1.4 GHz as a function of spin period. The effective survey sensitivity of searches with ALMA Bands 1 and 3 are indicated with red and green lines, respectively. These limits were scaled using a distance of 8.5 kpc to the GC and assuming an average spectral index of pulsars of −1.6. As can be seen, a significant fraction of the pulsar population lie above the sensitivity limits, even at the distance of the GC, and thus would be detected with phased ALMA. A common property of radio pulsars are steep emission spectra; that is, pulsars typically appear fainter at higher observing frequencies. So why go to such high frequencies? The reason is that a lot of turbulent ionised gas is in between us and the GC. This gas smears out the pulses from pulsars making them undetectable. Fortunately by observing at higher radio frequencies we can bypass these effects. As can be seen, there is an optimum frequency (or perhaps more than one) to observe the GC at for pulsars; it’s a balancing act between the two competing effects described above. To check if pulsars in the GC could be observed at these high frequencies, we took a look at PSR J1745-2900 with the IRAM 30-m telescope. The pulsar has been detected all the way up to 291 GHz (Torne et al. 2015, Torne et al. 2017 & Fig 2. )!